This wreath card shows a festive wreath decorating a red front door. 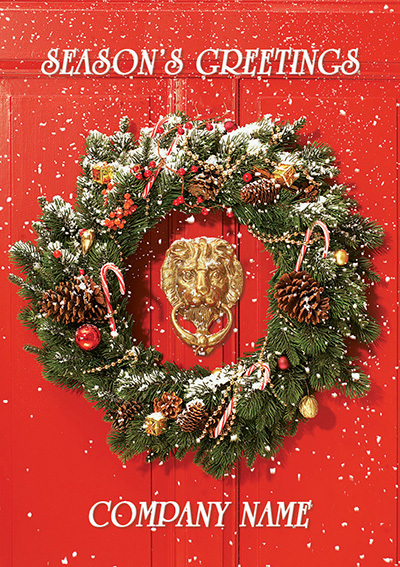 This wreath is decorated with candy canes amongst the berries and foliage, adding a fun and unique detail to the card. 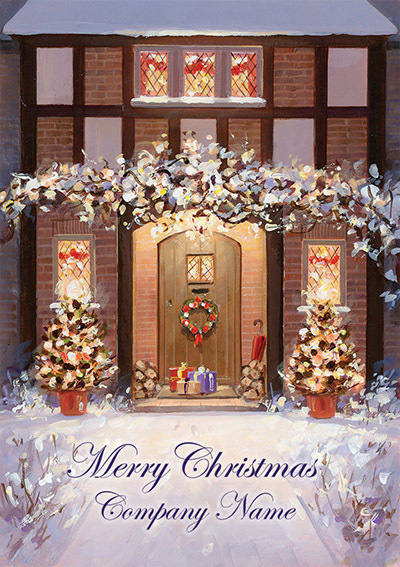 As with most of the cards on this blog, this Christmas card can be front personalised with your company name. 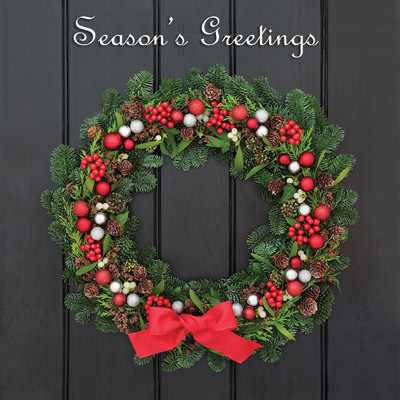 With inside personalisation printed directly onto the card and as will all of our Christmas cards they are supplied with free peel and seal envelopes. 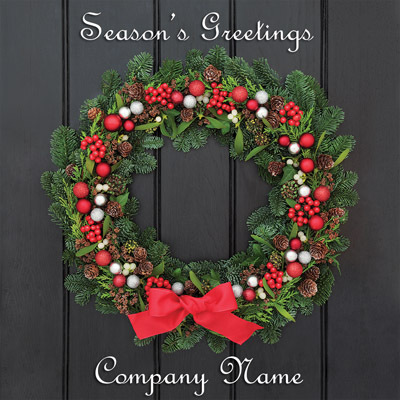 This wreath card features a more traditional wreath full of berries and baubles. The red and silver accents in this wreath contrast beautifully with the dark grey door which acts as the background for this card. This card is available in a front personalised version, with the inside personalisation printed directly onto the card. If you would prefer a paper insert, these can be added to most of our cards a cost of just 10p per card! With a minimum charge of £20.00. 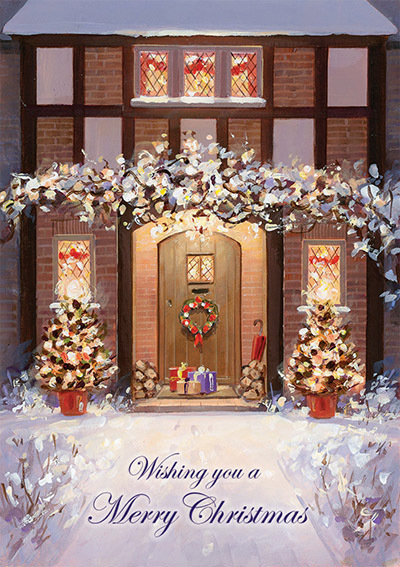 Our card Winter Warmth features a beautiful painting, showing a warm and inviting front porch in the snow. Decorated with a pair of illuminated frosty Christmas trees, as well as a festive wreath decorating the doorway and pile of presents waiting. This card is amongst my favourites from this year’s range, as it’s inviting atmosphere reminds me of travelling home for Christmas. 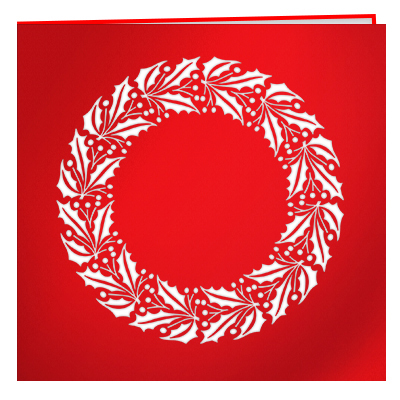 Our Laser cut Christmas Wreath card cards offers a luxury and unique card to send out this year. The design is laser cut onto a beautiful red pearl board, with a paper insert. You can personalise the show through colour of your paper insert to be any colour! The greeting inside will still be printed on white along with any personalisation and charity imprint.